Did your New Year's resolutions include a vow to "eat right"? 1. Eat right when you get up. You don't need to eat immediately upon awakening, but it's really important to eat in the morning. Those who eat breakfast regularly are better able to control their weight, while breakfast skippers are likely to over-compensate and eat too much at lunch. If you can't face much in the morning, try a bowl of oatmeal with a bit of protein powder stirred in, some fresh fruit with a scoop of cottage cheese or yogurt, or a protein shake made with protein powder, milk and fruit. If you do your shopping on an empty stomach, you'll be like a kid in a candy store – everything will look good to you. Grab a protein bar, a piece of fruit or a handful of nuts before you go out the door so you'll be less tempted. And make a list – and do your best to stick to it. We need small amounts of fat in the diet, but most of us eat too much. And, some fats – like the ones naturally present in fish, tree nuts, olives and avocados – are healthier than others. Healthy fats add flavour, so add avocado or nuts to your salad, or a dab of flavourful olive oil to steamed vegetables. You need to fuel up before your exercise – especially if you work out first thing in the morning. If you don't have much time to eat beforehand, easy-to-digest foods like smoothies, soups or yogurt do the trick. If you have a few hours to digest before you head out, have a regular meal with plenty of healthy carbs – whole grain breads, brown rice, pasta, fruits and vegetables – to keep you going strong. After a good workout, your body might be low on fuel, so try to eat something within 30-45 minutes after you finish your exercise. 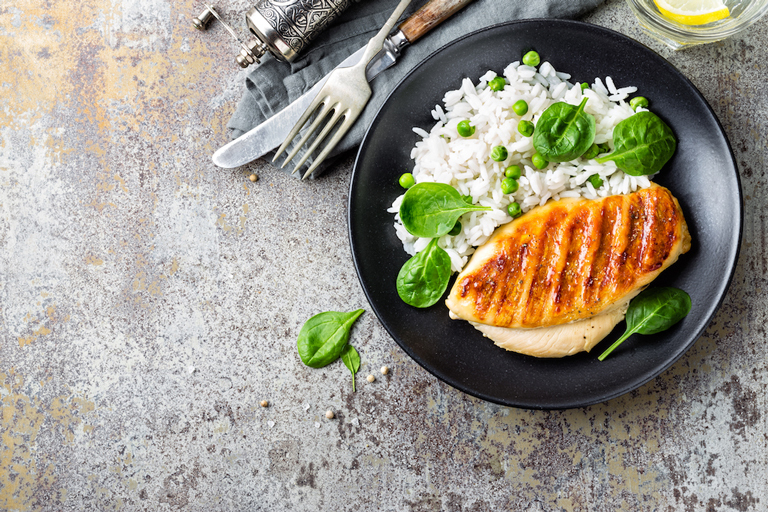 Your muscles are looking to fruits, vegetables and whole grains to help replenish their stock of carbohydrates – and a shot of protein to help them recover. We eat so many meals out these days that dining out isn't the special occasion it used to be. Resist the urge to splurge when you're out. If you're trying to cut your calories, split a starter with a friend and order an extra salad. Or, skip the starchy side dishes and double up on vegetables. Ask for dressings and sauces on the side so you can control how much you eat. A lot of people eat lightly or skip meals during the day, only to eat huge amounts of calories between dinner and bedtime. But when you do most of your eating at night, your brain and muscles don't get the fuel they need for your daily physical and mental activities. Instead, distribute your calories fairly evenly over your meals and snacks. If after-dinner snacking is piling on the pounds, try brushing your teeth right after dinner – it's one of the best ways to signal that you're done eating for the day.